BCECE Counselling 2018 is started from today by Bihar Combined Entrance Competitive Examination Board. BCECE Counselling Schedule has been released yesterday. It is going to be held completely on merit basis. Therefore to attend BCECE Counselling Schedule 2018, the Board issues call letter to all the eligible candidates whose name appears in BCECE Merit List. The counselling is being conducted for the aspirants who are seeking to take admission in the state colleges of Bihar, for admission to undergraduate courses offered in the field of engineering, pharmacy, and agriculture. The BCECE Counselling Procedure includes a subsequent number of steps, such as registration, document verification, BCECE Seat Allotment etc. In regards to more details, refer to the below section. Latest Update 28 July: Engineering stream 2018 seat allotment round 1 declared. candidate can log in and see the result. Check the link below. 2nd Round will be start from 04 August. Latest Update 27 July: BCECE Counselling Provisional Seat allotment letter expected to be available tomorrow. Latest Update 19 July: Hurry Up!! BCECE Counselling Submission of Choice for 1st round Started from today. Latest Update 18 July: BCECE Counselling Schedule released. “PCM Group and Engg. Stream” Check the schedule below. 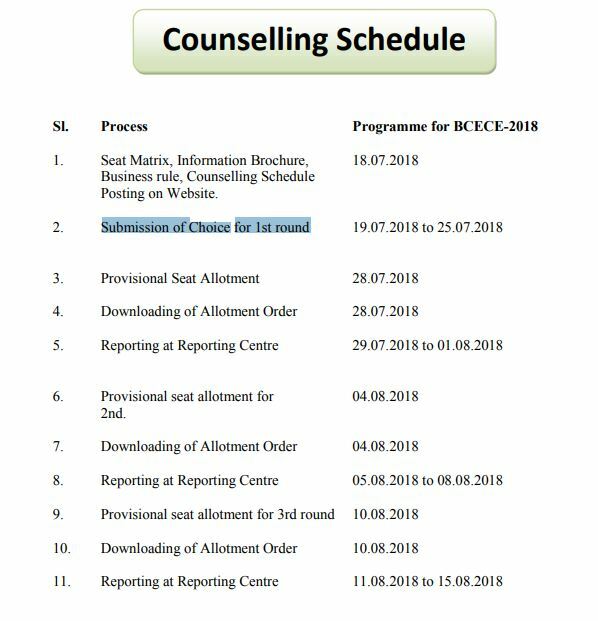 BCECE Counselling 2018 1st round Choise filling started from today.Thus to participate in the counselling session students must download the BCECE counselling call letter which will be facilitated online on the official website of BCECE Board and fill the Choise filling form. Aspirants who are eligible to attend the BCECE Counselling must register themselves first to attend the counselling. Registration can be done by entering the BCECE 2018 Roll Number, Name, Father’s Name and date of birth. Further, candidates must also enter details of their mobile number, address, and security question as well. In order to fill their required choices, candidates must log in using their roll number and password. After successful login, they are able to able to fill and lock their choices as per interest. A printout of locked choices must be taken for further references. After filling of choices, candidates have to log in again in order to check the status of their seat allotment. Aspirants will receive a provisional seat allotment letter which includes counselling venue.Candidates must take print out of provisional seat allotment letter and proceed further of the next process. Before the final seat allotment process, candidates handwriting will be verified. This process is conducted for ensuring that the right candidate is appearing in counselling. After the process of Handwriting Verification, candidates are required to log in again to check the final BCECE Seat Allotmnet 2018. Candidates must take a printout of final seat allotment letter and report to the college as mentioned in the allotment letter for the admission process. In the counselling venue, candidates must further participate in the document verification process and also make payment of the admission fee. Bihar Combined Entrance Competitive Examination Board is going to going to conduct BCECE Counselling 2018 after the declaration of BCECE results. Through our portal aspirants can get the latest update of BCECE Counselling Process and at the same time check the upcoming Engineering UG Entrance Examination.